The Meremaid Houseboat has a comfortable capacity of 12 guests in 6 beautiful double cabins, but can easily accommodate up to 18 guests. 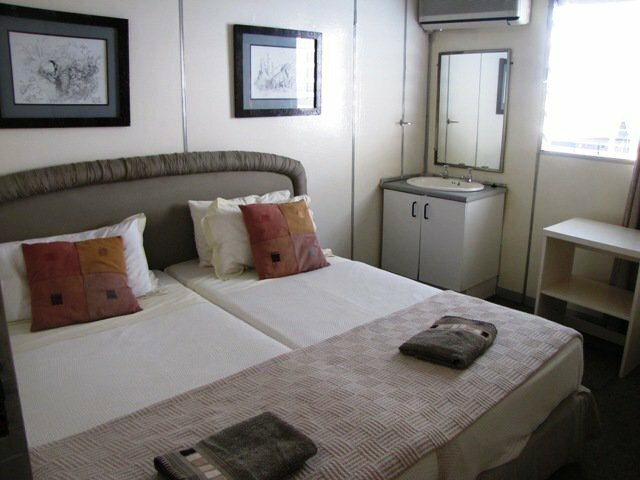 It is a semi-luxurious houseboat with spacious air-conditioned cabins containing wash-basin and mirror, in elegant yet simple design. The covered lounge, dining area and bar are quite inviting, with beautiful wood furnishing and comfortable seating. 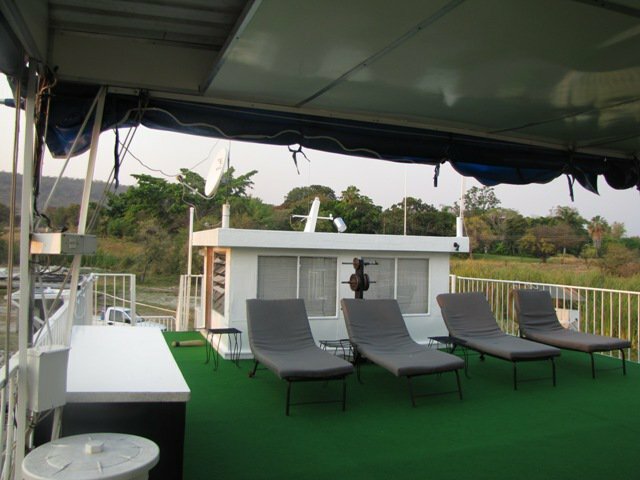 The Meremaid is a traditional "pontoon" Kariba houseboat which makes travelling a bit slow, but the advantage is the wide-open decks and plenty of space to relax and enjoy bird and game viewing, as well as the scenery, whether on the sun beds or by the jacuzzi on the top deck. 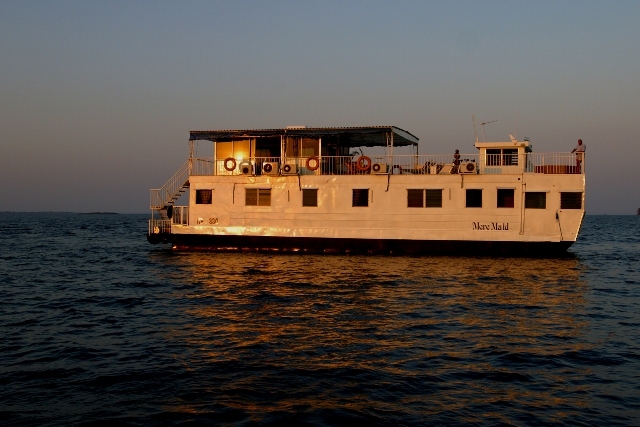 The houseboat is serviced with a crew of four to take care of your every need. The crew consists of a captain, chef, and two deck hands with their own quarters and ablutions. The Meremaid houseboat has good facilities on board, including music equipment to entertain yourselves, CD player, as well as limited gym equipment. We like the comfortable price of the Meremaid when it comes to the overall trip cost per person - of-course the more guests the better the price per person. • 6 double cabins with air-con. 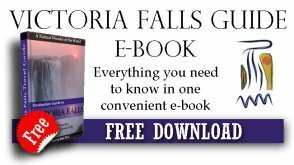 Please Note: Generator will be switched off at 10pm which is Government Stipulated Lake Rules. Therefore the Air Cons will not run after this time. • 220 V generator to run all electrical appliances. Plug points are square so clients should bring adaptors if necessary. There is also a cigarette lighter in the bar where phones and camera batteries can be charged. • Children 4 years and older are welcome. 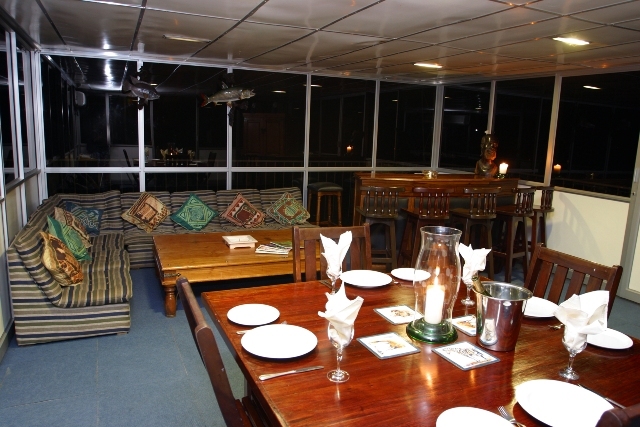 Self catering cost of charter is US$ 625 per night for a up of 12 passengers. * A fuel deposit of $300 is required before boarding. If there is leftover fuel, the balance will be refunded, but if the fuel consumption goes higher than $300 worth, guests will be required toe settle the balance. Fully inclusive cost of charter is available on request. Contact us for your requirements.